Never Enough Nails: OPI Washington D.C. Fall/Winter 2016 Swatches, Part 1!! OPI Washington D.C. Fall/Winter 2016 Swatches, Part 1!! I've had the OPI Washington D.C. Fall/Winter 2016 collection for a little while now, but I just couldn't handle swatching them until August. I really enjoy each season and I hate to rush through one to get to the next. But I was dying to swatch these and finally caved! OPI CIA= Color Is Awesome is the first polish I tried from the bunch and I was immediately in love. Deep dusky teal is pretty much my ideal fall color, so this was a winner for me. This is a great moody peacock blue-green that is just the right amount of vampy color for the fall months. I also love this because the name reminds me of the show my BF and I are currently binge watching on Netflix- Chuck. It's about this guy who gets a supercomputer basically implanted in his brain and now has all of the intelligence the various government agencies have gathered in his head. If you like action-y, spy-related shows with lots of humor thrown in, give it a try next time you need a new show! This is two coats of CIA= Color Is Awesome. The formula was great, it applied perfectly and was nicely opaque in two coats. OPI Pale to the Chief is a pearly light bisque shimmer. It's a nice neutral and the shimmer makes it more unique for me than a plain creme of the same color. The shimmer is the nice fine glowing kind and makes your nails look very smooth. This is pretty pale, so it will pop well against darker skin tones and still have some contrast with most pale skin tones too. This is three thin coats. Two coats had good coverage, but it was still a tad streaky, so I added a third. Otherwise it applied very well and had a nice consistency. It's no surprise to me that I love OPI Suzi- The First Lady of Nails. 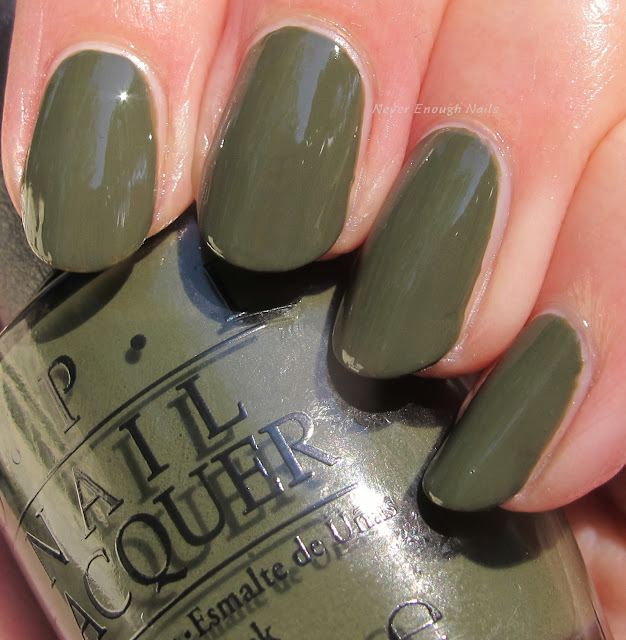 I am usually a big fan of olive green cremes and this one is no exception. 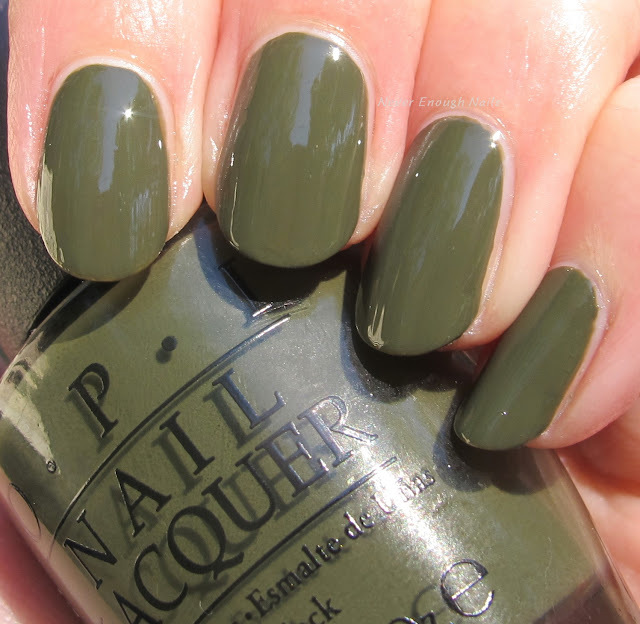 Olive green is so pretty in the fall too, I can't wait to wear this one! This one is great too, it's not too brown-toned, so it still looks primarily green. This is very likely a two coater, but my brush had some messed up bristles that I just couldn't straighten out or even remove all of them. I ended up doing three coats because the brush made it harder to apply it evenly. The formula of the polish is great though! OPI really gets me. Dusky peacock teal, olive green and now this interesting yellow, these colors are my fall jams! 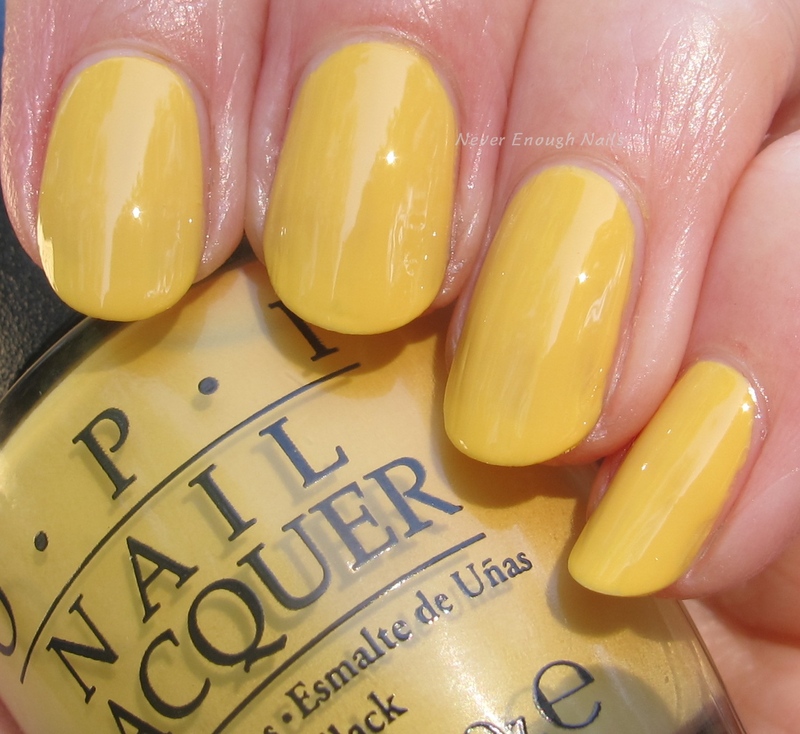 OPI Never a Dulles Moment is an interesting yellow with touches of pea green and mustard. OPI describes it as a "curry yellow" and that seems pretty accurate to me. It is a fantastic color and it's nice to see something that feels like fall but still manages to be different! This is three coats. It was nearly a two coater for me, but I thought it was still a tad streaky at two, so I added one more. Pretty even for a yellow though, I was impressed. 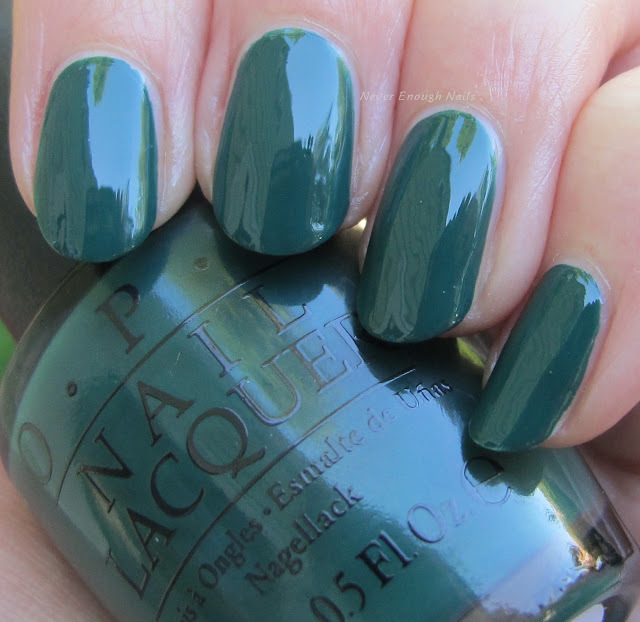 OPI Stay Off the Lawn is a great rainforest green creme. It has some blue tones to it and looks very luscious. It's dark enough to feel like fall, but I could still wear it in August and not feel like a traitor to summer. This was two fantastic coats. Stay Off the Lawn has a buttery formula that is nice and opaque. Every time I read, say or type the name "OPI Yank My Doodle", I die laughing inside. I just love to imagine the meetings in which people come up with these names. Yank My Doodle is a ginger rose creme. It's an interesting mix of red, copper and brown tones. I think this is a nice fall alternative to red or neutral colors. It feels like a fall color, but it's not so dark or bold that people will be uncomfortable wearing it. This is three thin coats, but it was nearly a two coater. I think most people would be fine with two coats. The formula was great, a perfect consistency. I will have the rest of the collection up for you as soon as possible. My favorites from this half are many, so I will wait to tell you my overall favorites in the next post!! OPI Washington D.C. is available now at fine salons and Ulta.com.